Melbournians are justifiably proud of their bar culture and thirsty citizens are never short of a place to drink. 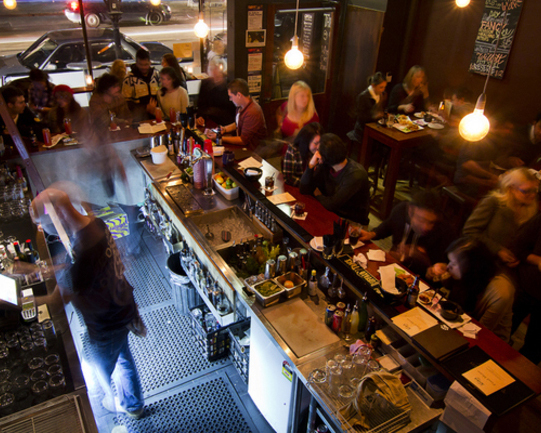 We noticed the city is becoming grungier in its dining habits, but drinking seems to have gone upmarket. Here are our top 10 picks for Melbourne bars, be they the high-glam, low brow or secret laneway variety. EDV. 1 Malthouse Lane, Melbourne. This cocktail bar with a whisky focus is hidden, fittingly, in a lane called Malthouse. EDV’s penchant for cocktails is balanced by its masculine decor; think jazz tunes, leather and polished mahogany. Bring your friends for a cocktail degustation dinner, a brave new territory where a five course food extravaganza meets and greets the very best of booze. Notoriously difficult to find, descending into Izakaya Den can fill the uninitiated with nervous excitement , but never fear, what you’ll find here are friendly faces and a space devoted in equal parts to the art of Japanese eating and drinking. Note the performance art that goes on behind the open kitchen and bar, with the chefs and mixologists dancing around each other. Obviously, all drinks have a Japanese bent, from sake to imported beers, but the range is wide and there is something for all tastes. The Everleigh’s location, hidden so that only those looking for it will notice it, says a lot about its character. 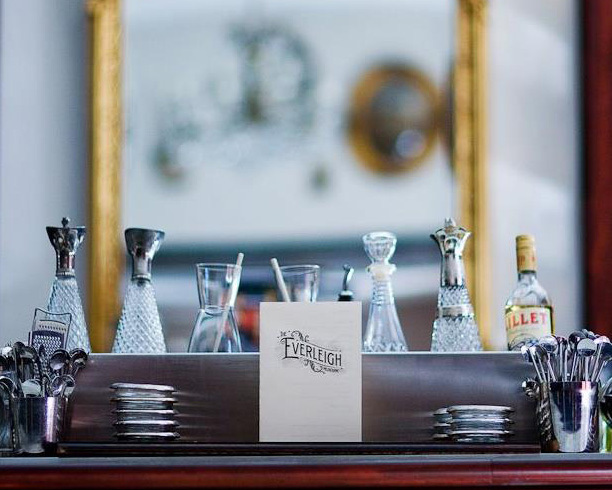 It’s a proper American-style cocktail bar of old, when drinks were bespoke and each glass was treated with courtesy. Candlelight glints off vintage chandeliers, well heeled patrons slide into mahogany booths and the air is filled with smooth jazz tunes that make you feel like you’re drinking in a golden age. The Black Pearl. 304 Brunswick Street, Fitzroy. Cocktail powerhouse The Black Pearl is the place to visit if you’re looking for a classy bar where you can drink posh without having to maintain a ramrod-straight spine. Downstairs, drink beer or whisky from vintage ‘70s tankards. Upstairs, in The Attic, maroon-shirted waiters serve exciting cocktails in crystal cut Royal Doulton glassware. Table service makes The Black Pearl personalised and civilised, but on the weekends, the bar is swamped three-persons deep with patrons determined to have a knees-up good time, whatever their poison. Kodiak Club. 272 Brunswick Street, Fitzroy. If you’re going to name a bar after a 500kg native American bear, you might as well have one represent. And the Kodiak Club does. Melbourne’s only bourbon bar is dominated by a wall-mounted Kodiak that watches over its patrons as they dig into all-American bar food. The space is warm and welcoming, much like a mountain lodge in a blizzard, and the bar is dominated by bourbon and rye whiskies, with a smattering of quality wines, beers and cocktails, plus some trashy Mexican beers for good measure. Cookie. First Floor, 252 Swanston Street, Melbourne. Any bar that describes itself as a “disco eating house and beer hall” is bound to make its patrons happy. Cookie somehow manages to fuse beer hall, cocktail bar and modern Thai restaurant with flair. The bar stocks a plethora of micro-brews and 350 different wines, plus, a hidden corner bar pours an endless stream of innovative cocktails. Cookie is smack-bang in the middle of the city, but transports you to a cooler plane, with its pastiche of French doors, Juliet balconies and manga inspired murals. Red Spice Road QV. 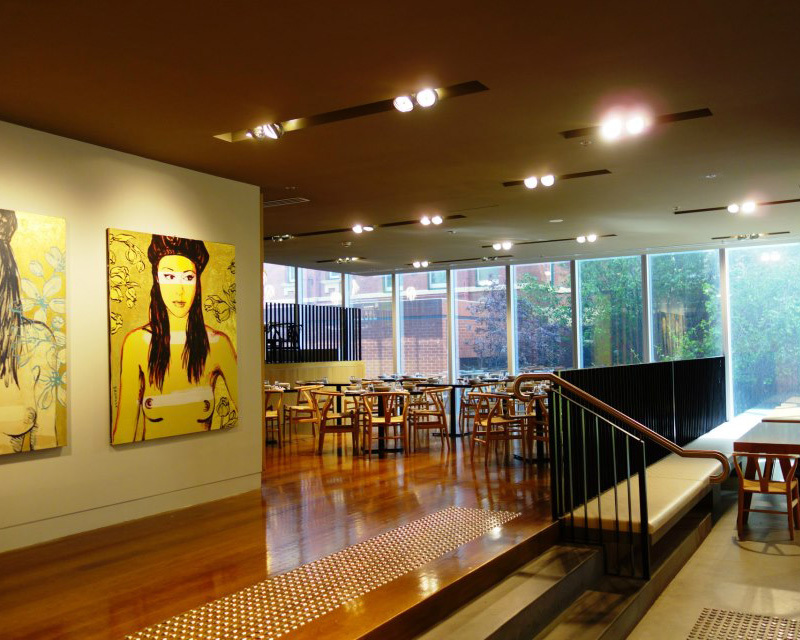 QV Melbourne, 31-37 Artemis Lane, Melbourne CBD. Overlooking the hustle and bustle of Lonsdale Street, Red Spice Road QV may be more of a restaurant, but it does a cracking martini. Sweet, sour or short, the cocktail menu is well-researched and the perfect side to the spicy cuisine of South East Asia. Take up a seat at one of their communal tables and enjoy a Red Spice mojito jugtail, the perfect complement to one of the restaurant’s banquet menus (either $60 or $75; with vegetarian options available). Lily Blacks. 12 Meyers Place, Melbourne. Lily Blacks is a high end gin joint and cocktail connoisseur’s dream that’s open till 3.00am, every night of the week. The decor gives a little nod to the 1920s speakeasy, with its potted palms, a wooden bar and doilies under the ashtrays. Lily Blacks takes a sophisticated approach to booze – the classics are served with a twist and assembled using the freshest ingredients and a flair for drama. There is a generous list of wines by the glass and for drinkers who prefer a simpler brew, there are numerous beers and ciders on tap. We recommend lining your stomach with Lily’s bar snacks, like charcuteries and cheese platters, olives and brandy-soaked prunes. Rooftop Bar. Level 7, Curtin House, 252 Swanston Street, Melbourne. Curtin House. Seven floors up. There’s a bar on the rooftop. What more is there to say? This venue is unquestionably one of the best for an open-air drink that’s as good as the view. In summer, opening hours are extended, burgers, wraps and ice cream sandwiches are on the menu and you can pull up a deck chair and catch a movie. Don’t despair the winter months, that’s when the Rooftop Bar’s relationship with MissChu bears fruit – in the form of rice paper rolls and other Vietnamese goodies, that is. The Waiting Room. Lobby, Crown Entertainment Complex, 8 Whiteman Street, Southbank. The Crown Towers lobby plays host to The Waiting Room, with its glamorous low lighting and mirrored jewel box interior. The bar has revived the sophisticated art of mixology, with cool cocktails, classic martinis and premium champagne the order of the day. Of course, the drinks have to share the limelight with Neil Perry’s impressive array of bar snacks and light meals.